The Full Moon is Wednesday July 4. Mars is in the western evening sky. Saturn is visible near the star Spica in the northern sky and is visited by the Moon on the 28th. 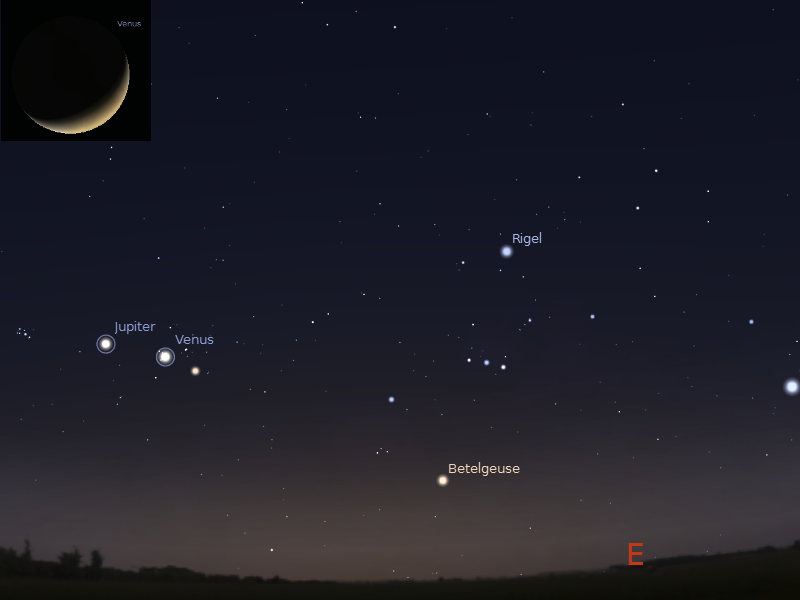 In the morning skies Jupiter and Venus can be seen close together on July 1. 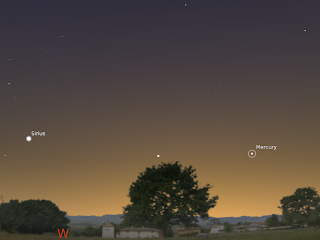 Mercury is visible low in the evening twilight. Morning sky on Sunday July 1 looking east as seen from Adelaide at 6:30 am local time in South Australia. Jupiter is near Venus in the Hyades, making a sline with the red star Aldebaran.The the Pleiades cluster is close byThe inset shows the telescopic view of Venus. Similar views will be seen elsewhere at the equivalent local time (click to embiggen). Jupiter climbs higher in the morning sky this week. It is now reasonably easy to see. 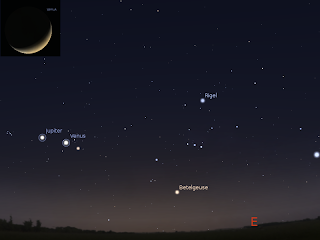 Jupiter moves towards Venus and the Hyades over the week, being closest to Venus on July 1, when it forms a straight line with the red star Aldebaran. Bright white Venus climbs higher above the horizon this week. Venus is an obvious crescent seen through even a small telescope. Venus travels through "A" shaped Hyades cluster, and makes a line with the bright red star Aldebaran and Jupiter. Evening sky looking west as seen from Adelaide at 5:45 pm local time on Saturday June 30 showing Mercury above the horizon. Similar views will be seen elsewhere at the equivalent local time. Click to embiggen. The Full Moon is Wednesday July 4. Mercury is at its highest in the evening sky this week. It is still best seen with a flat, uncluttered horizon. Mars is in the constellation of Virgo. It's brightest object in the north-western sky, and its distinctive red colour makes it easy to spot. Mars is at its highest in the northern sky around 5:30 pm local time and sets shortly after 11:30 pm. Saturn is above the north-western horizon, not far from the bright star Spica. Saturn is high enough in the northern sky for telescopic observation in the evening, being highest at 7:00 pm local time.Saturn was at opposition, when it is biggest and brightest as seen from Earth, on the 16th of April, but now is still a great time for telescopic views of this ringed world. Saturn and Spica are visited by the waxing Moon on the 28th, with the Moon being very close to Spica. Printable PDF maps of the Eastern sky at 10 pm AEDST, Western sky at 10 pm AEDST. For further details and more information on what's up in the sky, see Southern Skywatch. Carnival of Space #255 is Here!